The Black Bears have five wide receivers who can make a difference, and they'll all be needed in Friday's playoff game at Weber State. 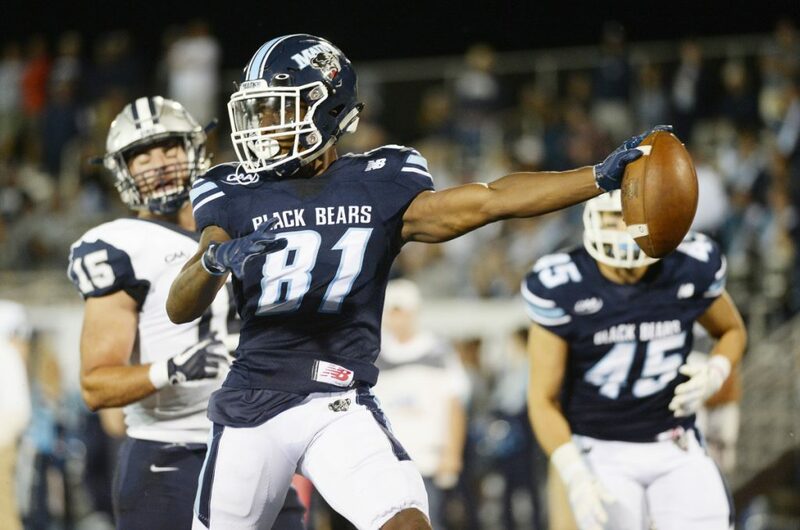 ORONO — They call themselves “Top Flight.” And it’s a fitting name for the University of Maine’s wide receivers because they make the Black Bears’ offense fly. Maine’s identity has been – and always will be – one of a tough, physical football team that thrives on a black-and-blue running game. But this year, its wide receivers – Earnest Edwards, Micah Wright, Jaquan Blair, Devin Young and Andre Miller – have taken the offense to new heights. Of Maine’s 43 touchdowns this year, 20 were on passes to wide receivers. In last week’s 55-27 win over Jacksonville State in the second round of the Football Championship Subdivision playoffs, they caught four of quarterback Chris Ferguson’s school playoff-record five touchdown passes. They’ll need to be at their best again Friday night when Maine (9-3) plays at Weber State (10-2) in the FCS quarterfinals. The Wildcats have one of the nation’s top defenses, ranked 20th among FCS teams, and allow only 198.7 passing yards per game. The confident Black Bears aren’t fazed. “As long as we play our game we’ll be fine,” said Blair, a 6-foot-2 junior from Harrisburg, Pennsylvania. “We’ll go out there and have some fun. In the seven games since Ferguson returned from a shoulder injury – an injury also forced him to miss parts of the final two regular-season games – Maine’s passing game has come alive. The Black Bears went 6-1 and averaged 210.3 passing yards per game. In the two games he missed, Maine averaged just 172 passing yards per game and completed just 48 percent of its passes. Edwards, a junior from Rochester, New York, may be the star. He leads Maine with 46 catches for 722 yards (15.7 average) and nine touchdowns. He also has rushed for 124 yards and two touchdowns, and returned two kickoffs for touchdowns in the regular-season finale. But Ferguson spreads the ball around. As Blair said, “Fergy shows the love.” If someone works to get open, Ferguson is going to find him. Wright, a senior from Newark, New York, has caught 42 passes for 480 yards (11.4 average) and six touchdowns. Tight end Drew Belcher is next with 38 catches, followed by Blair with 37 for 492 yards (13.3) and four touchdowns. Young, the redshirt freshman from Binghamton, New York, has caught 29 for 198 yards (6.8) and one touchdown. And Miller, the sophomore from neighboring Old Town, averaged 22.5 yards on his six catches. Nick Charlton, Maine’s offensive coordinator, said the Black Bears are taking more downfield shots this year. He said that was lacking in 2017 and told Ferguson and the wide receivers that it was going to be a bigger point of emphasis this year. So they worked on it all offseason: passing inside the dome in the winter, outside in the spring and summer. And now the offense is purring. The offensive line is playing well. Ramon Jefferson and Joe Fitzpatrick are piling up rushing yardage – the team rushed for 268 yards last week – and the receivers are confident no one can cover them one-on-one.